Later swathing increases crop yield because side branches have longer to fill and average seed size for the whole plant is larger. The ideal is to swath when most (or all) side-branch seeds are “firm to roll.” Mushy watery seeds will not mature if swathed in that state. 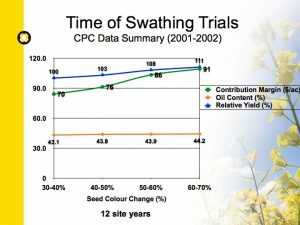 Read more on plant population and swath timing. 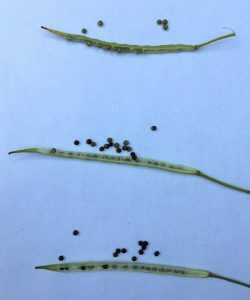 With thin stands and uneven stands, growers will often have to strike a balance between shattering of earliest pods and watery seeds in the latest pods. 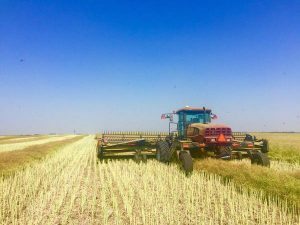 If that makes for an unsettling situation, it may be worth reassessing seeding rates and stand establishment practices to increase plant populations. 1. Drive around the whole field, if possible, to locate a couple of areas that best represent the stand, stage and yield potential of the crop. Check a few plants in these areas. 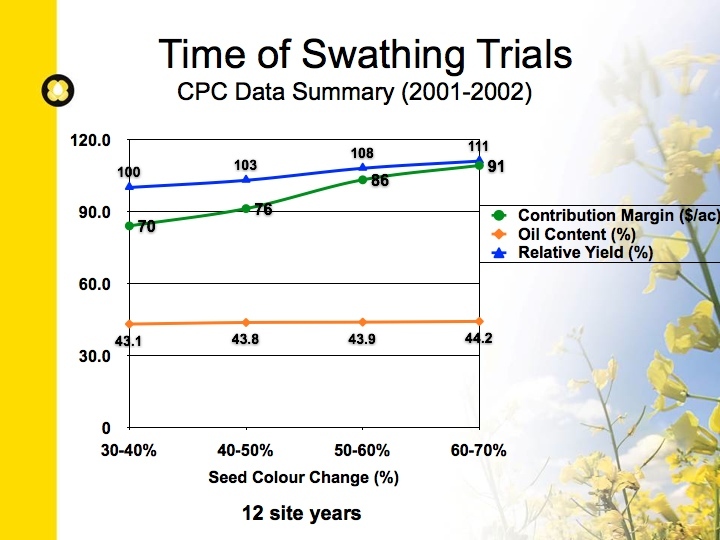 Walking through mature canola is difficult but you do want to get beyond the headlands. 2. Isolate the main stem, which is typically the longest branch with the most pods. Open pods from the bottom, middle and top of the main raceme. How many seeds have started to turn? SCC is considered any amount of brown on the seed. Finding the main stem may not be as easy as it sounds. Follow the smooth side of the stem, dodging collars that will indicate a side branch connecting to the main stem. If it takes too long to ID the main stem, pick a different plant. 3. As a rough guideline for 60% SCC, seeds from pods at bottom third of the main stem will be totally black to purplish brown, seeds from the middle third will be starting to turn, and seed from the top are green but firm and will roll between your thumb and forefinger without mushing. 4. Look at seeds in the latest of the side branches. Are they firm to roll? If not, yield will likely benefit from waiting — if you have time. 5. While checking, look at plants that are ripening pre-maturely. Disease is a common cause. 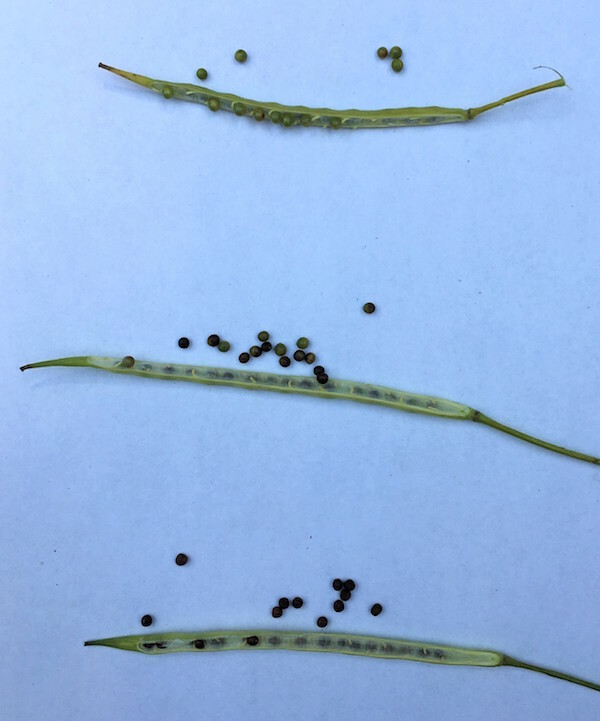 Identify the disease so management steps can be taken to reduce disease severity in future canola crops. This is what seeds at the top, middle and bottom of the main stem will look like at 60% seed colour change. Pod colour is not an accurate indicator of seed colour change. In some cases, green pods can contain colour-changed seeds and, vice versa, turned pods can contain green seeds. Sun scald adds to the confusion.